The home project where losing is the aim of the game. 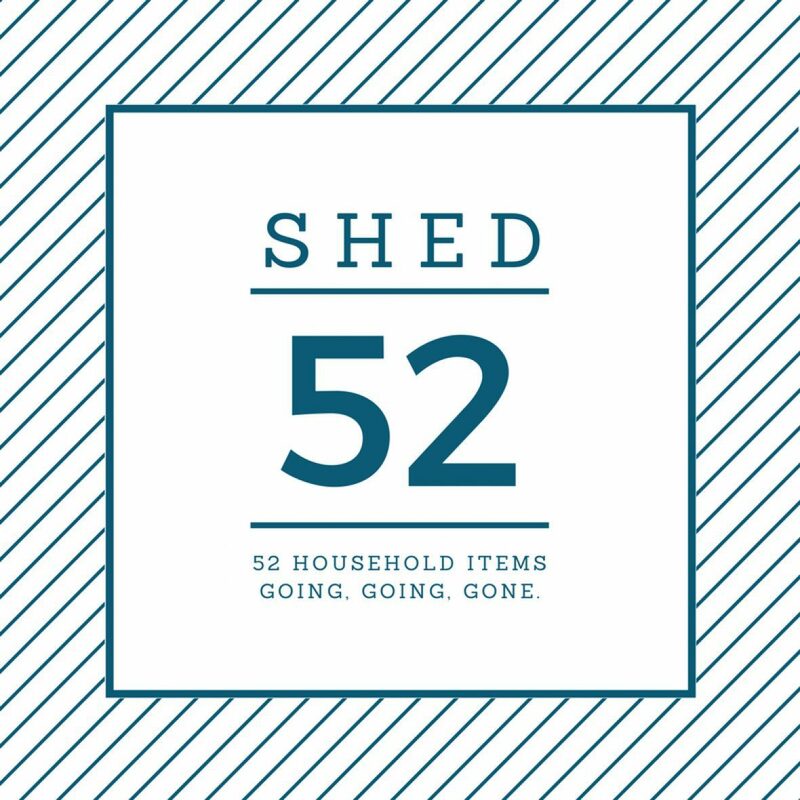 As I read Shed52, I am struck by how much it is less about getting rid of stuff and more about the existential meaning that we make of our stuff and the meaning our stuff suffuses into our lives. Shedding possessions would be easy if it were simply a matter of finding things – inanimate objects – around us that clutter our lives and thereby also our thoughts. But our thoughts are so attached to our things, not out of avarice or need, but out of a matrix of meaning in which we are ensconced. It is difficult to shed our stuff because of the significant space it takes in our minds. Example 1: My car. Today my car sputtered out and was left on the side of the road for dead. As a mass of metal, electronics, and rubber, it holds no particular importance in my life’s priorities. As a means of transportation, it holds somewhat high importance because it isn’t so easy to get from Brookline, where I live, to Norton, MA, where I teach, by public transportation or even Uber or Lyft. But the car – and its treasonous transmission, or whatever it is that gave way – is symbolic in my mind of so much more than mere transportation. I’m not talking status symbol or even American independence (which, in the popular mythology, has been constructed around our vehicles). I’m talking survival mode. The demise of my automobile is inextricably linked in my mind with my economic, physical, and mental deterioration. I’m sure that this is just apocalyptical exaggeration. But am I? Which is the lie – that it will be alright, or that it is the beginning of the end? I waiver back-and-forth in my judgment. RIP you little silver beast. Example 2: Memorabilia. I don’t know about you, but I have a little box in which I place various items of what I affectionately call “Memorabilia.” These items include movie ticket stubs, birthday cards, concert programs, and old driver’s licenses and school ID cards. I find I put something in the little box about once a week. This is frequently enough that, by the end of a year, or six months even, the little box needs to be emptied into a big box. And after 40 some-odd years of walking this planet, those big boxes now tally in the double digits. Why do I do this? I don’t know. I enjoyed the movie – or more likely the companion with whom I went to the movies. I imagine someday I may want to recall just what pieces were performed at the concert. I like to see what I looked like when my driver’s license was issued and compare it to the next expired license. In those cartons is contained my life – or so it feels. Lose that and there goes my entire past. Boxes of every student ID, alumni magazine and toll receipt Jason ever had. Example 3: Books. Yes, I am a bibliophile. Books, or “The Original Portable Information Device,” as I like to call them, have a tangibility to them that the Kindle does not. I can feel the pages and, as I love to do with old, weathered, yellowing books, smell the pages. We are living in a digital world and I am a material girl, to turn a phrase. But more than that, books mean so much beyond their presentation to the senses. They are friends from my past or, possibly friends I shall discover in the future. There are also those books that were left to me from my father. He didn’t have a life insurance policy. He didn’t have money. He didn’t have a mansion. But he did have books – tons of books! As someone remarked to me soon after his untimely death, “These,” she said, feeling the spines of the books on the shelves of his library, “these are your inheritance.” She was right. I could remember as a child, almost from before I could read, wandering among his stacks and stacks of books (before he had a library in which to house them) and seeing all the covers and dust jackets and wondering in awe what was contained within them. Some of them I began to read over the years. A literary favorite and the perfect gift. Valentines Day 2016. And then when I went to college, I would ask my father if I could “borrow” this book and that for my classes. Never did I return any of those books. And then, after college, when I would visit home, it became a ritual of mine to silently wander among his tightly packed shelves and pull out a book here and there that caught my eye. His library was organized in a haphazard way – very loosely by topic. Each time I performed the ritual, I could swear new books were appearing. But though he occasionally bought new books, the fact wasn’t that I was finding all the new ones, but that my interests were growing ever more broad and so a book that I passed by before would now call to my rapacious curiosity. Since reading that quote – and I don’t recall where I came across it – I have heard more and more about this novel by Walter M. Miller. Suddenly, there it was in my father’s wide-raging collection of low tech mobile information devices. I took it and about thirty other volumes from the library and had to bid farewell to all the other books that made up his collection – a reflection of his mind – and accept that no longer would new titles appear as if from nowhere among that sacred space for me. So you see, stuff is not really just stuff. The stuff that is just stuff is easily parted with. But the stuff that we carry with us– sometimes it sinks us, and sometimes it carries us right back. What’s the stuff that carries you? What do you know is so special, that you could never part with it? Tell us below and check back on the blog this week to learn where Shed52 falls in our list weekly goals! And our materialism fascinates me to no end. I’m currently trying to get rid of the overwhelming amount of *stuff* I have (starting with clothes), and it’s difficult. I tend to keep paper mementos from places Jonny and I go (tickets, brochures, maps), and we try to buy a magnet in each place we like (a small collectible that has a place). I have a hard time parting with books, even ones I don’t like, and I’m not sure why. It’s the same with random art supplies. I’m a creative person, but I admittedly don’t have/make the time to try all of the mediums I collect stuff for. Why do I do this? Anyway, stuff is weighing be down right now, so I’m trying to unload it and stop myself from replacing those items with new things.